Jeffrey Ross Hyman was born on May 19, 1951, in Queens, New York to a Jewish family. His parents were Charlotte (née Mandell) and Noel Hyman. 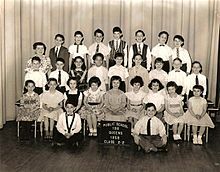 The family lived in Forest Hills, Queens, New York where Hyman and his future Ramones bandmates attended Forest Hills High School. Though happy, Hyman was something of an outcast, diagnosed at 18 with obsessive–compulsive disorder. He grew up with his brother Mickey Leigh. His mother, Charlotte Lesher, divorced her first husband, Noel Hyman. She married a second time but was widowed by a car accident while she was on vacation. Joey was born with a parasitic twin, which was a malformed Siamese twin growing out of his back. The twin was incomplete and thus it was surgically removed. Hyman was a fan of the Beatles, the Who, David Bowie, and the Stooges among other bands, particularly oldies and the Phil Spector-produced "girl groups". His idol was Pete Townshend of the Who, with whom he shared a birthday. Hyman took up the drums at 13, and played them throughout his teen years before picking up an acoustic guitar at age 17. Ramone's voice was within a tenor range. His signature cracks, hiccups, snarls, crooning and youthful voice made his one of punk rock's most recognizable voices. Allmusic.com claims that "Joey Ramone's signature bleat was the voice of punk rock in America." As his vocals matured and deepened through his career, so did the Ramones' songwriting, leaving a notable difference from his initial melodic and callow style—two notable tracks serving as examples are "Somebody Put Something in My Drink" and "Mama's Boy". Dee Dee Ramone was quoted as saying "All the other singers [in New York] were copying David Johansen (of the New York Dolls), who was copying Mick Jagger... But Joey was unique, totally unique." Ramone produced the Ronnie Spector album She Talks to Rainbows in 1999. It was critically acclaimed but was not very commercially successful. The title track was previously on the Ramones' final studio album, ¡Adios Amigos!. Joey Ramone died from lymphoma at New York-Presbyterian Hospital on April 15, 2001, a month before he would have turned 50. He was reportedly listening to the song "In a Little While" by U2 when he died. 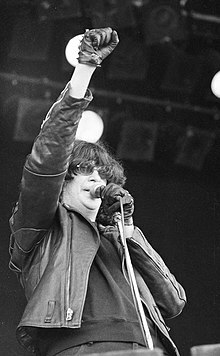 In an interview in 2014 for Radio 538, U2 lead singer Bono confirmed that Joey Ramone's family told him that Ramone listened to the song before he died, which Andy Shernoff (The Dictators) also confirmed. 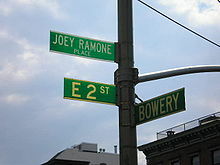 On November 30, 2003, a block of East 2nd Street in New York City was officially renamed Joey Ramone Place. It is the block where Hyman once lived with bandmate Dee Dee Ramone and is near the former site of the music club CBGB, where the Ramones got their start. Hyman's birthday is celebrated annually by rock 'n' roll nightclubs, hosted in New York City by his brother and, until 2007, his mother, Charlotte. Joey Ramone is interred at Hillside Cemetery in Lyndhurst, New Jersey. Several songs have been written in tribute to Joey Ramone. Tommy, CJ and Marky Ramone and Daniel Rey came together in 2002 to record Jed Davis' Joey Ramone tribute album, The Bowery Electric. Other tributes include "Hello Joe" by Blondie from the album The Curse of Blondie, "Don't Take Me For Granted" by Social Distortion, "Here's To You" by Minus3, "You Can't Kill Joey Ramone" by Sloppy Seconds, Joey by Raimundos, "I Wanna Be Your Joey Ramone" by Sleater-Kinney, "Red and White Stripes" by Moler and "Joey" by the Corin Tucker Band, "I Heard Ramona Sing" by Frank Black, and Amy Rigby's "Dancin' With Joey Ramone". Rammstein ended several shows of their Mutter tour in 2001 with a cover of "Pet Sematary" in honor of the passing of Joey Ramone. After several years in development, Ramone's second posthumous album was released on May 22, 2012. Titled ...Ya Know?, it was preceded on Record Store Day by a 7" single re-release of "Blitzkrieg Bop"/"Havana Affair". The opening track of U2's 2014 album Songs of Innocence is called "The Miracle (of Joey Ramone)", paying tribute to the Ramones' influence on U2 from a show which the band members had attended in the late 1970s. Bono claimed that Ramone showed him how to sing. In the HBO television series Vinyl, James Vincent Boland appears as Joey Ramone - then using the pseudonym Jeff Starship - during his stint as lead singer of the pre-Ramones band Sniper. ^ a b c Huey, Steve. Joey Ramone at AllMusic. Retrieved July 27, 2011. ^ I Slept with Joey Ramone: A Punk Rock Family Memoir – Mickey Leigh – Google Books. Books.google.ca. Retrieved December 18, 2012. ^ Powers, Ann. (April 16, 2001). "Joey Ramone, Punk's Influential Yelper, Dies at 49". The New York Times. Retrieved June 2, 2009. Born Jeffrey Hyman in Forest Hills, Queens, Mr. Ramone grew up a sensitive outcast in a bohemian family. ^ Ramone, Marky; Herschlag, Rich (2015). Punk Rock Blitzkrieg: My Life As A Ramone. Music Press Books. p. 132. ^ "The musical misfits". BBC News. April 16, 2001. Retrieved July 27, 2011. ^ a b Legs McNeil, John Holstrom (1997). Please Kill Me: The Uncensored History of Punk. Penguin. ISBN 0-14-026690-9. ^ Mickey Leigh, Legs McNeil (2009). I Slept with Joey Ramone. Touchstone. ISBN 0-7432-5216-0. ^ Kaufman, Gil. "Joey Ramone Rocks The Reservation". Vh1.com. Archived from the original on February 9, 2013. Retrieved September 30, 2015. ^ "Band Biography". The Independents. April 15, 2001. Archived from the original on July 24, 2011. Retrieved July 27, 2011. ^ Interview Still in Rock with Andy Shernoff "Still in Rock"
^ U2 (2001). Elevation 2001: Live from Boston (DVD). Boston, Massachusetts: Island/Interscope. ^ Kaufman, Gil (April 15, 2001). "Punk Pioneer Joey Ramone Dead at 49". MTV. Retrieved July 27, 2011. ^ "Joey Ramone Place – Street Sign in New York". Ramones.kauhajoki.fi/ramones.html. Retrieved July 27, 2011. ^ "Sometimes the Grave Is a Fine and Public Place". New York Times. March 28, 2004. But there is a slew of other places around New Jersey with their own pantheons. Consider the eclectic group at rest in Hillside Cemetery in Lyndhurst: the Pulitzer Prize-winning poet William Carlos Williams and both founders of the former industrial giant Becton-Dickinson, Maxwell Becton and Fairleigh Dickinson, for whom the New Jersey university is named. Three years ago, they were joined by the seminal punk rocker Joey Ramone, whose birth name was Jeffrey Hyman. ^ "The Bowery Electric Crew". RamonesWorld. Archived from the original on November 28, 2010. Retrieved April 22, 2012. ^ "What's New York's most-stolen street sign?". TODAY. Associated Press. September 27, 2010. Retrieved July 27, 2011. ^ "Ramones: Joey Ramone'S Second Solo Album Titled ...Ya Know?". ramones.kauhajoki.fi/ramones.html. Retrieved April 27, 2012. This page is based on the Wikipedia article Joey Ramone; it is used under the Creative Commons Attribution-ShareAlike 3.0 Unported License (CC-BY-SA). You may redistribute it, verbatim or modified, providing that you comply with the terms of the CC-BY-SA.